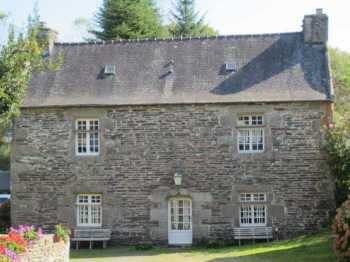 In the heart of one of the most beautiful villages in the Monts d'Arrée in a preservation area... lovely old priory dating from the 16th century authentically renovated in 1995. Offering good sized accommodation (168m2) and a great development of the original stunning elements: monumental fireplaces, granite spiral staircase, carved lintels, mullioned windows, arrow slits - wonderful!... Ground floor: Sitting room with fireplace, fitted kitchen with fireplace, storeroom- boiler room, bathroom. Up the lovely stone staircase to find the WC,On the 1st floor, 2 magnificent bedrooms with fireplace and exposed beams with their own shower and WC., and 2 more with their basin . Over this is the loft in need of finishing with shower and WC. Lovely enclosed garden of 600m2 with little stream flowing through and a pond. It is very beautiful, it is peaceful, it is magical... a must see!